I am not gonna lie, I am pale AF. When the British weather is at it's very best in the Summer I hardly ever tan. I mainly burn in the sun and I end up resembling a lobster. As you can imagine that is NOT an attractive look. It's certainly not a look I want to go for. I hope and pray that one day I will somehow tan naturally and end up looking like a beautiful bronzed goddess, however that day is yet to come(I'm not sure it ever will). For now I am settling for that good old bottle of fake tan. I am definitely not one that likes a subtle wash of colour. I have always opted for a darker tan over a lighter one, even though I am fair skinned. I want to look like I just spent two weeks away in Spain, so I was hoping that the St Tropez Extra Dark Bronzing Mousse would do just the job. In preparation for applying the tanning mousse, I exfoliated, shaved and moisturised my whole body the night before, and proceeded to fake tan the next morning. It is an absolute must for me to stick to that three step body routine before fake tanning. That way my tan applies a lot smoother, and reduces the chance of it applying patchy in the areas which are prone to dryness such as the knees, elbows, feet etc. 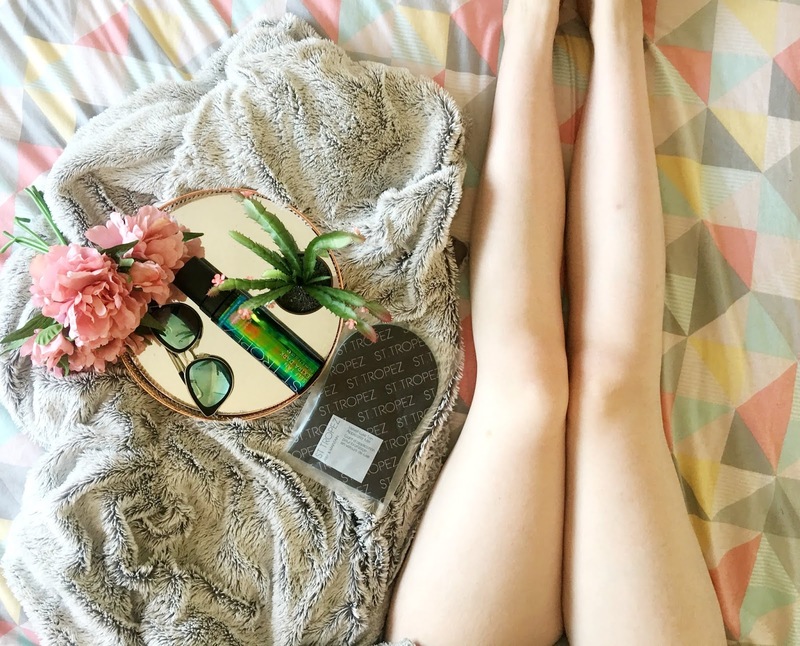 Now when it comes down to the nitty gritty, I tan my feet first and work my way up, though I don't like to apply it directly to the face as I am acne prone and so I'm quite cautious about it breaking me out. You can choose to leave it on for four hours for a dark tan or the maximum eight hours for a deeper, darker tan. I chose the latter. I found the mousse very easy to apply. The guide colour really helped me to blend it in evenly, avoiding any streakiness. It was an absolute dream to use. I think I overdid it on my knees though, which you will see in the after photo, oops. I haven't fake tanned for a few years though, so that's my excuse, haha. All was solved after a little light exfoliation. The tan does have a slight green undertone to it, though it doesn't translate onto the skin itself. It looks very much like an olive based tan, as opposed to it being orange based which I love. It made my skin look so natural, you almost can't believe it's fake. I have stretchmarks from having my boys and they were hardly noticeable when I was wearing it. What I love the most about it is that it doesn't transfer either! I applied it in the morning, went about my day, came home and washed the guide colour off, and I was surprised to see none of my clothing was stained with fake tan. It also doesn't have that dreaded 'biscuity' smell that most fake tans have which I LOVE! I can't quite describe how it smells. Overall, I absolutely love this tan! I cannot rave about it enough. It gives you the most natural bronzed glow without streaking or transferring, AND it doesn't smell like biscuits. I mean, what's not to like? I feel like I have so much more confidence when I'm wearing it. 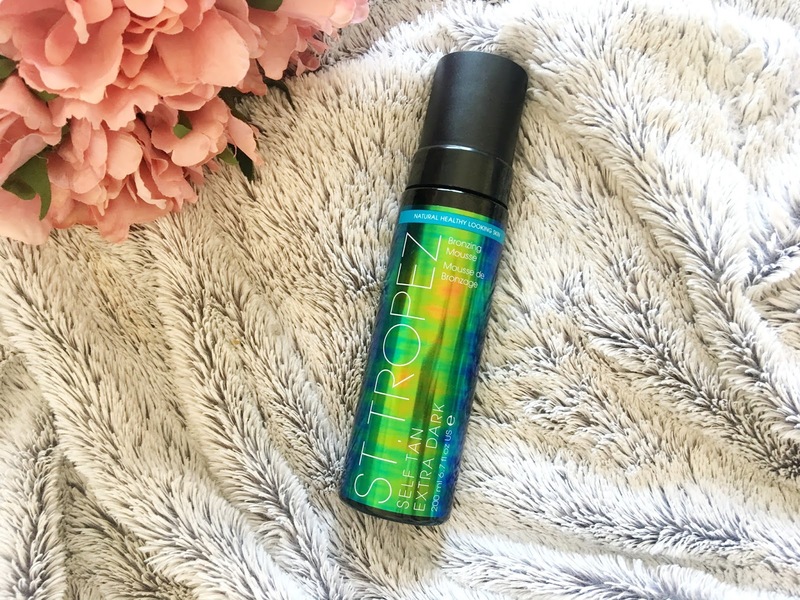 You can currently purchase the St Tropez Extra Dark Bronzing Mousse directly from St Tropez here for £34, but it's currently on offer for £16.95 on Superdrug here. Have you tried anything from St Tropez before? If so, what are your thoughts?